IRELAND’S BIGGEST NEWSPAPER group has reported another drop in income as extra cash from digital ads failed to make up for the fall in its print trade. Independent News and Media (INM) said its total revenue dropped 1% in the first four months of the year despite its advertising take rising slightly on improved market conditions. The company also confirmed the offloading of its stake in Australian and New Zealand media group APN for €115.8 million, which it will use to pay of its debts. Overall, its turnover from digital advertising was up over 45% for the period, which INM said offset the drop in its print ads – although it also suffered a fall in circulation revenues. 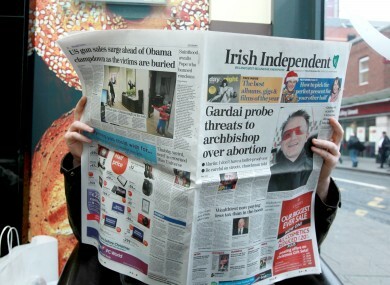 Circulation for the Sunday Independent, the best-selling Sunday title in the Republic, dropped 4.5% to 219,007 copies for the last six months of 2014 against figures for the same time in 2013. The fall was slightly lower at just over 4% for the Independent, the country’s best-selling daily paper, which had a circulation of 112,502 copies for the second half of last year. The company said it would continue to cut operating costs “with a particular focus on efficiencies” as it modernised into an “agile media organisation”. Last year its total revenue fell slightly to €318.7 million, although operating profit was up 4% to €34 million when compared to 2013. Last financial year the company spent €9.3 million on redundancies as part of cost-cutting measures that were expected to mean one in eight staff were out the door. “There has been strong growth in digital advertising revenue, with a continuation of the positive trajectory reported in the 2014 full year results, validating the unique audience reach INM offers advertisers,” the company said. Email “Independent News and Media wants to be an 'agile media organisation'”. Feedback on “Independent News and Media wants to be an 'agile media organisation'”.